Science funding agencies distribute money to support research in various ways. Depending on the type of research they support, this is split between “investigator-initiated” where researchers subm it their best ideas along with as compelling back up as they can muster using other resources and “strategic” whereby the agency identifies areas that need research but that, for some reason, are either not being addressed by researchers on their own initiative or which have particular urgency. The ratio of dollars directed to investigator-initiated vs strategic envelopes varies and, in the Harper years (~2006–2015) tended to swing more to applied and strategic and away from investigator-originated or “unfettered” science as David Naylor is fond of calling this type of research. There is certainly a case for both types of funding. While scientists are often most productive and effective when left to themselves to come up with new ideas (and remembering that only 1 out of 15 of these is ever funded), we also tend to cluster around hot areas of science, much like 6 year olds chasing a soccer ball. It is good to tease out coverage of science, even if such top-down intervention can be the result of self-serving expert committees, lobbying for their own favourite niche. When the Naylor panel published their report, in what seems a decade ago, but was only April 10, 2017, they suggested a 70:30 ratio of funds for unfettered:fettered. This seems very reasonable (as does the rest of the report). Both types of research funding come in the form of either research grants that support a topic for a period of time (usually between 1 and 7 years) or salary support (studentships and fellowships) that support trainees. There is a plethora of these vehicles and another recommendation of the Naylor report was to simplify/consolidate this diverse and often overlapping array. But these mechanisms all share the same philosophy with respect to granting agencies. That is, in any given competition, funds are committed for a set period of time and, unless there is cause (mischief, relocation, etc), these funds are locked in to the particular successful recipient. This is similar around the world and has an important implication for how funding agencies manage their funds. I’ll stick to Canada’s tricouncils for this illustration, as they are tasked with distributing the majority of research funds to Canadian researchers. These agencies have a renewable base budget. Typically, they can count on at least the same amount of money from the treasury every year and, in most years, receive a small bump to accommodate inflation and/or additional mandates (usually fettered to identified initiatives). 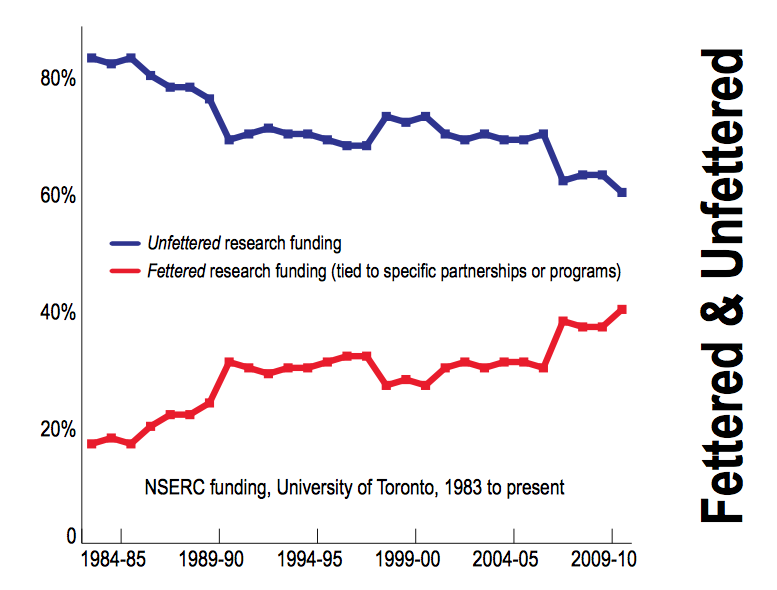 So NSERC or CIHR receive about $1 billion each annually (not all of this is under their control, some flows through to other programs — having the effect of inflating their budgets). Let’s simplify the math and assume they each get to spend all of the $1 billion on their grant and trainee support programs. Lets also set the average grant term at 5 years (it’s not that far off). Thus, in any given year, at steady state, they have just $200 million to spend on new grants and trainee support. The other $800 million is spent on grants and awards from the prevous 4 years. This is a good way to support science in a consistant manner as it means that projects can be reliably funded across multiple years. As a consequence of the stability and pattern of funding, there are new competitions are regular intervals. Some are run annually, others bi-annually, etc. But pretty much every dollar that is newly committed is derived from the relief of commitment to a previous award that has come to the end of its term. The funding envelope is thus recycled, largely suporting a similar number of grants and awards in any given year (the exception to this is when CIHR tore up the rules for grant programs and embarked on the disastrous “reforms”, but I’ve written about that ad nauseam). The point I am excruciatingly slowly getting to is that as the peer review adjudication process winds its way in selecting the “best” grants, the results of the competitions tend to have predictable announcement dates. Just like exam results, grant and award applicants know beforehand when judgement of their submitted work will be released,when they’ll find out if they are funded or not (and most will not). The semi-annual or annual self-flagellation ritual begins on the anointed day and is marked by continuous clicking on the “decisions” page of the relevant agency web portal until bliss or despair is encountered. NSERC, for example publically released its Discovery Grant results on May 22nd, 2009. And April 9th, 2010. And May 3rd, 2011. And April 20th, 2012. And May 2nd, 2013. And June 26th, 2014. And April 25, 2015. And June 23rd, 2016. And September 8th, 2017. Wait, what? For the previous 8 years, results have been published in a window between April 9th and June 23rd. Except this year when there was a 10 week delay. This is odd, to put it mildly. What might be the reason for the delay? 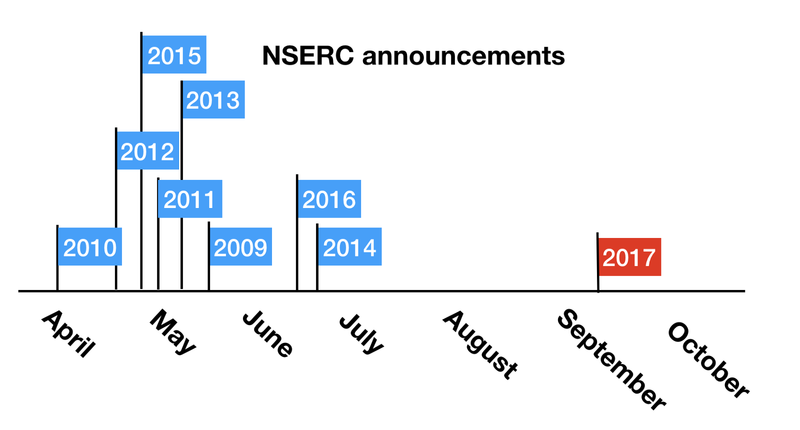 Looking at the past 5 days of official Tweets from the Minister of Science (@ScienceMin), the Honourable Kirsty Duncan, 19 of 33 relate to the NSERC announcements not to mention a bunch of others via @KirstyDuncanMP. Indeed, Minister Duncan was present at the University of Victoria for their announcement. As was the Minister of Infrastructure & Communities (Minister Sohi) at U of Alberta, Minister of Public Safety and Emergency Preparedness (Minister Goodale) at U of Regina, Minister of Foreign Affairs (Minister Freeland) at U of Toronto, and Minister of National Defence (Minister Saijjan) at UBC (see addendum). Previous governments have done this despite the “tick-tock” rhythm of predictable, unsexy funding results that can be difficult to get excited about (it’s the results of the research that are the most meaningful, new discoveries, cool technologies, etc). This is all good and it’s great to see some attention being lavished on the rather mundane but critical workhorses of science — the tricouncils. But why delay the official public announcements —it turns out the scientists all knew their results a couple of months before. Moreover, why enlist 5 cabinet Ministers for the occasion of an annual set of results, the equivalent of Halloween or Canada Day barbecues? Surely this can’t have anything to do with the active campaigns and op-eds over the Summer to encourage the government to #supportthereport and #studentsforthereport? There was no net new money being announced. Indeed, thanks to a rare (once in almost a decade) freeze on tricouncil funding in the 2017 Federal budget, there was literally NO new money to announce. The Liberal Party campaigned in 2015 on a pledge to increase use of evidence in government, to unmuzzle Federal scientists, to commision a review of fundamental science and to restore the long-form census (delighting science geeks like me). They’ve ticked all of those boxes. Yay! There was also an increase in tricouncil budgets in 2016 (another big plus). But the Naylor panel also dared recommend a 30% increase over 4 years in tricouncil funding to return the agencies to their relative status in 2007. Since the publication of the report, there has been relative silence. I hear there may be an announcement of a formal response next month (October). I also hear the funding recommendation was judged too rich. Could these September announcements be part of a coordinated effort to appear as though new money is being invested in fundamental science? To soften up the argument of the Naylor panel. Let’s hope not. Scientists understand fiscal pressures. Heck, many are barely keeping their labs together, others have folded, losing years of research investment. Researchers also appreciate there are many compelling calls on government — indigenous health, poverty reduction, the fentanyl crisis, immigration, famine relief, bailing out Bombardier (OK, not that one). What they don’t appreciate is being made to look as though they are being rained upon by new research dollars. Let’s hope instead that these announcements are a part of a clever plan by the Minister of Science to engage her cabinet colleagues and the public in the affairs of science and to encourage their support around the cabinet table when it comes to restoring Canadian science to its previous levels of success. Because there is no doubt that Minister Duncan understands the role and place of science in a successful developed nation— her challenge is to convince her PMO colleagues to deliver on their commitment. Our job is to continue to reach out to the public and to politicians to demonstrate the importance of science. September 13 addendum: Two additional announcements, one from the Minister of International Development and La Francophonie (Minister Bibeau) at U Sherbrooke and one by Kate Young, Parliamentary Secretary to Science Minister Kirsty Duncan at U Saskatchewan. Toronto researcher working on diabetes, stem cells, cancer & neuroscience. 140 chars are my own pithy but open access thought-lets.